Retail $31.95 SAVE 34% ! A little bigger than my other similar sized case. But its perfect. durable, nice quality, looks great displaying my model at my office. Shipping and customer service from HobbyLinc was fantastic and well packaged as well. Case is very big and nice, I will be able to fit 2 larger tanks 1:35 scale, but has a number of complaints: a) it does not comes with holding wire, b) dose not has dedicated drilling spots, c) does not closes as tight as regular other cases Overall if you need this size - go for it, however be aware of the things listed above. Very nice product. One piece base, with one piece clear cover. Perfect for 1/35 models. I am using this for the 1/35 Kitty Hawk MH-6J Littlebird. I am able to fit hesco barriers in the case also. 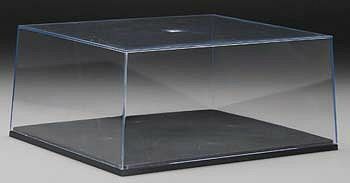 Simple display case, fits most single and twin engine aircraft in 1/48. Case is very clear. No distortion.